An apparently unpublished and previously unknown poem by Carl Sandburg that addresses the topic of guns has been discovered at the University of Illinois Rare Book and Manuscript Library. CHAMPAIGN, Ill. - In an apparently unpublished and previously unknown poem, Carl Sandburg addressed the topic of guns. 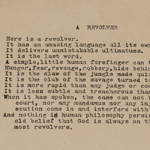 Titled "A Revolver," the short piece was discovered last week among Sandburg's archives, housed in the Rare Book and Manuscript Library of the University of Illinois at Urbana-Champaign. The poem, typed on a manual typewriter on onionskin paper, was discovered by a library volunteer. Sandburg, an Illinois native, was the recipient of the Pulitzer Prize for poetry in 1919 and 1951, and for history in 1940 for his biography of Abraham Lincoln. The poem was found last week by Ernie Gullerud, a retired U. of I. professor who has volunteered at the library every Thursday for more than seven years, helping to index the more than 4 tons of material that make up the Sandburg collection. 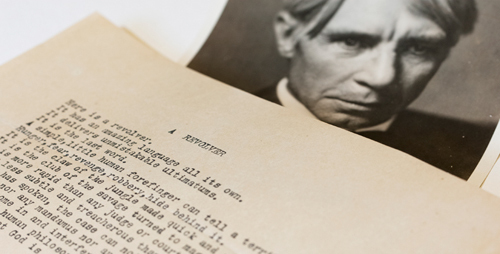 Gullerud, who is 83, is in the process of documenting the first and final lines of all Sandburg's poems to make them searchable online. This poem, typed on a manual typewriter, begins: "Here is a revolver." It ends 11 lines later: "And nothing in human philosophy persists more strangely than the old belief that God is always on the side of those who have the most revolvers." As Gullerud entered this basic information for "A Revolver," he felt compelled to read the lines in between. "It's just amazing how something written way back then is relevant today," he said. With the recent mass shooting in Newtown, Conn., and the subsequent debate over gun control in mind, Gullerud decided to share the poem with Valerie Hotchkiss, the head of the Rare Book and Manuscript Library. "I think it's so interesting that Sandburg says poetically what we all know about guns: that they are the final word," Hotchkiss said. "But he takes the idea one step forward to meditate on the effect of guns on freedom of speech - how the First Amendment is watered down by the Second Amendment. If somebody has a gun to your head, you can't speak freely." Kathryn Benzel, a Sandburg scholar who is the Martin Distinguished Professor in English at the University of Nebraska at Kearney, called the poem "an amazing find." "He has a lot of anti-war poems, poems that undercut the sense of war as the answer to whatever question somebody might have," she said. "So the fact that he would write this poem ... is really indicative of his perception of violence in society." The final line, she said, echoes another Sandburg theme of "railing against hypocrisy." George Hendrick, a U. of I. English professor emeritus who edited several volumes of Sandburg's poems, said this one may have been inspired by the Lincoln assassination. "Sandburg was very concerned about that murder, and the use of the gun that killed Lincoln," Hendrick said. "It sounds to me as if he had thought about this problem for years and years before he wrote this poem." The poem is undated (Sandburg died in 1967), but Hotchkiss is certain of its authenticity, citing the smudgy f and A that match other poems from Sandburg's typewriter. "This has all the marks of a Sandburg poem on it," she said. "This is clearly written on Carl Sandburg's dreadful onionskin typewriter paper."